On Saturday October 27th, the Bucks County Intermediate Unit (Bucks IU) held a craft fair ben­e­fit­ting their Education Foundation, through which teach­ers can apply for grants that sup­port edu­ca­tion­al pro­grams. To date, almost a half mil­lion dol­lars in grants have been dis­trib­uted, mak­ing a sig­nif­i­cant impact in the growth and devel­op­ment of stu­dents through­out Bucks County. However, the mon­ey raised was only one small part of how this Craft Fair is ben­e­fit­ting Bucks IU stu­dents. Amongst the 45 crafters exhibit­ing their wares, were sev­er­al tables of excep­tion­al items that were cre­at­ed and craft­ed by Bucks IU stu­dents with spe­cial needs. Teachers and stu­dents explained how both aca­d­e­m­ic and life skills train­ing are effec­tive­ly inte­grat­ed with art‐based cur­ricu­lum to sup­port growth and devel­op­ment. Reading and fol­low­ing instruc­tions, mea­sur­ing, cal­cu­lat­ing expens­es against item cost – all of these incor­po­rate and uti­lize the edu­ca­tion­al skills of these stu­dents in prac­ti­cal, every­day ways. Students work as teams, sup­port­ing one anoth­er with their indi­vid­ual strengths and skill sets, with the added ben­e­fit of boost­ing their social skills and self‐esteem. These arts pro­grams pro­vide a means by which these stu­dents can achieve high­er lev­els of inde­pen­dence and employ­a­bil­i­ty. Travis Goodman (left) and Michael Patrohay (right) are Bucks IU stu­dents work­ing togeth­er to sell their spe­cial pet treats from ‘Michael’s Barkery’ at the recent Bucks IU Indoor Craft Fair. cora­tions; each unique with dif­fer­ent but­tons, scarves, and hats. From scent­ed can­dles in pret­ty wood topped jars, framed nature pho­tographs, to folk art wood­en wall plaques with hol­i­day sen­ti­ments – the cre­ativ­i­ty and qual­i­ty were won­der­ful. Another fea­ture of Bucks IU Special Education Programs, is how they strive to incor­po­rate a student’s fam­i­lies into rein­forc­ing the skills their child is learn­ing. Michael Patrohay is a Bucks IU stu­dent who loves his dog and help­ing his Mom in the kitchen. His par­ents found a way to incor­po­rate that into a lit­tle busi­ness; Michael’s Barkery which makes Gourmet pet treats, and sup­ports keep­ing Michael involved and his skills sharp. 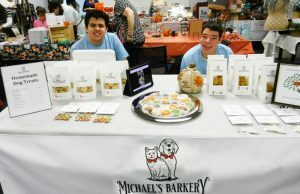 Michael works with his Mom to bake all of the pet treats and togeth­er, the fam­i­ly pack­ages and attends events where they can sell them. Michael’s vibrant smile and out­go­ing nature make him a per­fect sales­man. Where he strug­gles is with num­bers, so he has enlist­ed his good friend and fel­low Bucks IU stu­dent, Travis Goodman, as his cashier. Together they make an amaz­ing and high­ly suc­cess­ful team, who enjoyed a steady stream of cus­tomers at the recent craft fair. The arts pro­vide a plat­form for edu­ca­tion and advance­ment in a cre­ative and engag­ing way that res­onates with stu­dents who have spe­cial needs. For more infor­ma­tion about Bucks County Intermediate Unit Special Education Programs, please vis­it our web­site at www.BucksIU.org or call us at 215–348-2940.